Enjoy an evening on a beautiful, sustainable farm, and help Community Crops grow! 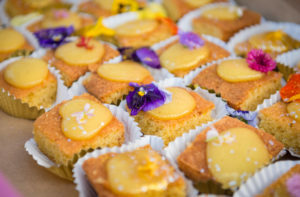 The Feast on the Farm showcases the best of local foods, prepared by your favorite local chefs. 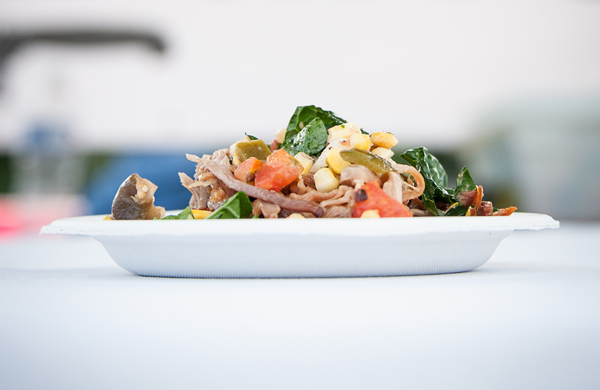 As you wander the farm, you will enjoy a full dinner, while seeing where your food grows. Purchase your 2018 Feast on the Farm tickets now! Meier’s Cork and Bottle will serve beverages to accompany the meal. Tours of Prairie Pines will be offered throughout the evening and Community Crops staff will be on hand to share details about the organization and the families it helps. 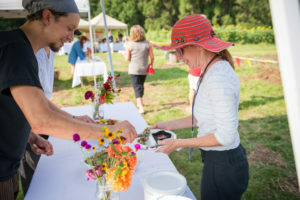 Margaret Davenport at the Daily Nebraskan wrote, “Feast on the Farm was incredible. Everyone I met was exceedingly passionate about his or her products or about supporting the local businesses and excited to share any and all information with me. I learned a lot about the food community, ate a ton of amazing food and got a free tree. It was possibly the best night of my life.” Read the full story here. Read a great description of last year’s event here in the Lincoln Journal Star here. Thanks to all of our 2018 Feast on the Farm sponsors! Click here for the full details on all of the benefits of being a Feast sponsor, including promotional opportunities. Purchase your Feast on the Farm tickets now! Even if you can’t attend the dinner, you can still support Community Crops. Make a donation to help families grow nutritious food. All guests are asked to park in the Faith Lutheran Church parking lot at 8701 Adams St. Please park in the north lots as there is a service happening at the same time. 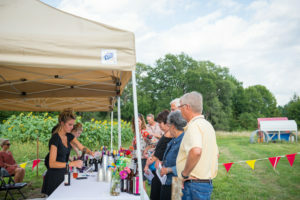 Crops volunteers will be on hand to shuttle guests the short 2 miles to Prairie Pines, and will bring guests back to their cars at the end of the event. Directions: Take Adams east of 84th. Just east of 87th, turn right into the driveway of Faith Lutheran (8701) and watch for signs/volunteers to direct you to a parking spot. Please only park in the north parking lots of the Church to not disrupt the event happening that evening.